Devlog KAG Build 2409 - New Profiler, Emotes, Translations, Fixes and More! Discussion in 'Announcements' started by Geti, Nov 21, 2017.
Who is your favourite new Emote? Poll closed Dec 5, 2017. Quite a lot of community contribution in this one, as is becoming a pattern. This is great to see! It's good to see this make it through to the public. Sorry for the wait - I know it has been a few weeks coming. We've had some back and forth on a few of the changes, and I've been sick on and off the past few weeks. I'm healthy again now, so fingers crossed we can continue with smaller "rolling" updates. This build includes about 150 commits across over 120 files to the base repository and about 40 commits across over 200 files to the engine repository, so it's no small patch. 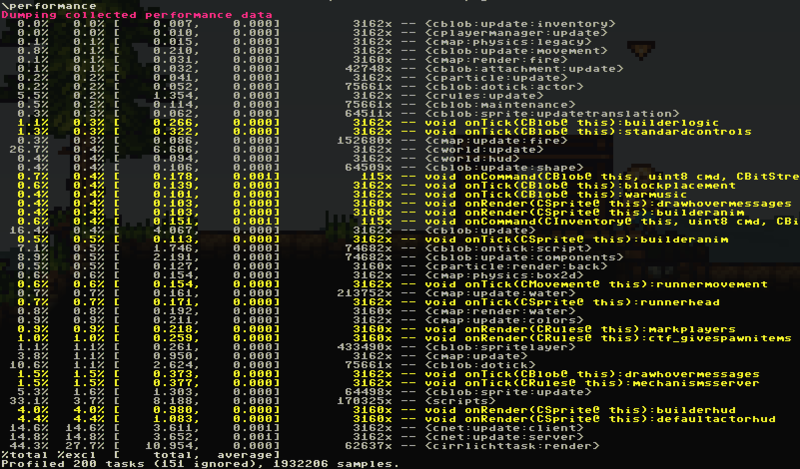 The build includes contributions from Myself, MM, Furai, Asu, Fuzzle, and Diprog. I got a lot of engine-side work done on translations, fixed a few regressions from last build and got a few miscellaneous work items done. I also added some work-in-progress emoticons from recent discussion in discord to the sprite-sheet for use. We welcome feedback on these emoticons but they should not be treated as necessarily a permanent addition; we'll figure out which ones have a place in the game and which don't soon enough. They are only available through the config file currently, so to save you the trouble, here's a look at them - note that a few of these are just touch-ups, most are new. MM actually spent some time in the codebase, to partly address the precache issues causing crashes and other issues when swapping servers and swapping between local gamemodes and online play. There are still some ongoing glitches to look into, but it's quite an improvement over how things were before. Fuzzle has been sitting exams but completed a refactor of the materials scripts and configuration files. This shouldn't affect mods from what I can tell, it just cleans up the code a little. Diprog and the rest of the Russian translators have helped extend the translation support a huge amount, and provided RU translations to match. This includes menu translations, gamemode and UI translations, a few tricky edge cases with descriptions, and indicating requirements for improved support for unicode and localisation within the engine. Asu has been very productive this month; There is a new profiler, improved map loading performance, a fix for a long-standing linux bug, more french translations and a handful of smaller things as well - check out the changelog for more info. It's quite a "technical" addition, but the new profiler will help vanilla devs, contributors and modders diagnose and fix performance issues in their scripts and in the engine. It profiles both engine-side tasks and all script hooks, can sample at a reduced rate, and reports multiple metrics per measurement. It's also gentler on performance than the previous profiler. Scripts are in yellow, engine tasks are in grey. To turn on profiling, use /g_measureperformance 1 in the console on startup or once the game is loaded, and then /performance to dump the current performance statistics. You can clear out the existing samples with /performanceflush - perhaps if you want to measure performance around a specific event. Because of the slight performance overhead, this setting is turned off each startup, so setting it in your auto-config won't work. Outside of the game, our Discord Server also got verified which means we have a fancy new invite link and higher performance voice servers. We're currently hovering around 900 members, and as ever it's onwards and upwards! Thanks so much to the discord admins for their tireless efforts and to the community for rallying behind the server so well. [added] linux dedicated server is forced to EN locale with a warning if it was something different. This means we can rely on translated strings from server still being in english for re-translation on client (eg descriptions). - people are suspicious of this change currently so we should run a week or two without it and see if the suspicions hold up. [important] map loading changes are likely to bite anyone with a custom map loader if it's based on BasePNGLoader. Lowest effort fix would be getting the old BasePNGLoader from github, renaming it to OldPNGLoader and including it in your mod directly. PNGLoader::handlePixel's signature is the main change - contact Asu for help in discord if you need it! Anyone only using customblocks.as should be unaffected though, as nothing has changed there. Check the changes to TradingCommon.as if you want the details. Varion, makmoud98, Noburu and 24 others like this. Noburu, Yeti5000, Gurin and 6 others like this. bunnie, Didgedy, epsilon and 1 other person like this. l3afysamz, bunnie, 8x and 1 other person like this. it seems the really useful ones from classic will never show themselves again. l3afysamz, Yeti5000, bunnie and 3 others like this. Biurza, Didgedy and butterscotch like this. 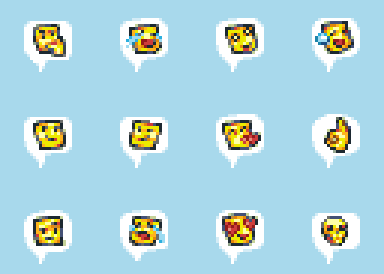 Most of the emotes look wonky or oblong. I dislike them. Yeti5000, bunnie and Didgedy like this. I can't wait to use in tdm while i'm an archer using my grappling hook to hang in a place knight's can't get me. Varion, Blue_Tiger, FuzzyBlueBaron and 6 others like this. Smoochy all the way. By the way, great work guys! Not all the emots work through the config file. From 40 upwards. Also, I already fell in love with the "okay hand" emot, it has many meanings as well. Used for team communicating, for saying "oh babe a triple", and for intimidating the enemies. Yeti5000, joshua12131415 and The_Osz like this. I'll release a short explaination on the new profiler soon, but I have to do some changes and proof reading to do due to some minor "last minute" changes on it. Geti's summary was good though. Be aware that, for now, the linux platform will give you the most accurate results. Results on other platforms will be at least as precise as previously, but because I didn't have test environments for mac & windows I only used greater precision timers on the linux target. FuzzyBlueBaron and Kazaco97 like this. The one on the right is the new one, the one on the left - the old one. enderzilla747, Yeti5000, AmestriStephen and 3 others like this. Don't know if anyone's reported it yet, but chests aren't spawning in TDM, and neither are spikes on a lot of maps. kodysch, Asu, Yeti5000 and 1 other person like this. kodysch and Yeti5000 like this. One of the new emotes is a redo of this emote. Derp emote from Classic is fine. The entirely new emotes are good but feel slightly out of place. Varion, enderzilla747, Yeti5000 and 1 other person like this. Just gotta say, for all my grumbling on discord Geti, the new emotes continue to grow on me. If I had to guess I'd say it's more an issue with me being a grumpy bugger who doesn’t like change than any real objections to the new emotes themselves. Varion and FoxyLady like this.